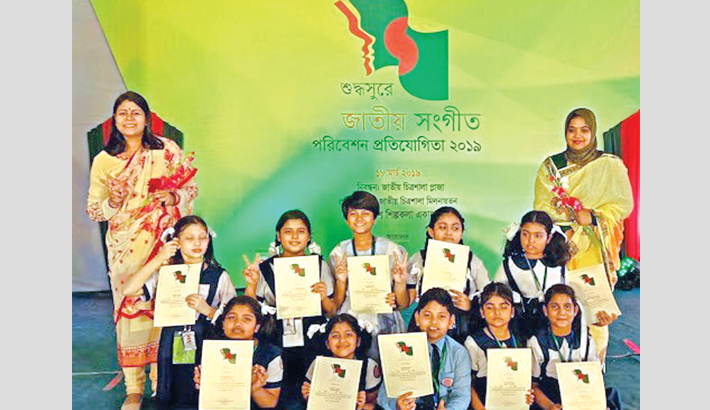 Primary section of Mohammadpur Preparatory School and College has won the national anthem competition. The competition started on February 3 from the ‘thana’ level and the final round was held at Bangladesh Shilpakala Academy in the city on Monday. The Ministry of Cultural Affairs has been organising the competition since last year. Tasnima Begum Elee, the music teacher of the institution, said her school also won the first prize last year. Prime Minister Sheikh Hasina will distribute the awards of the competition at a programme held at Bangabandhu National Stadium in Dhaka on Independence Day on March 26.